Alison is a conceptual plein air impressionist. Her subjects depict the natural beauty of light in the landscape, while emphasizing the rich colors our world has to offer. The vast majority of her work is created in open air, often backpacking to remote locations, or navigating city sidewalks. Alison loves painting directly from real life and experience. 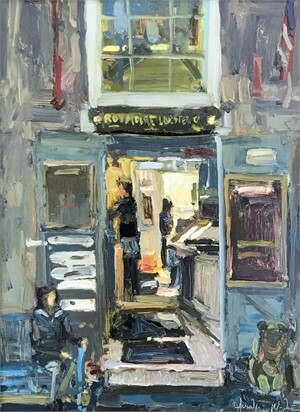 Her approach stresses the importance of expressing a true sense of light and place while showcasing the qualities of oil paint and brushwork. Painting thick and thinking abstract design, she loves to use texture and color to move a viewer around her painting. Alison Leigh Menke was born abroad in 1987 and raised in Howard County, Maryland. Growing up she was impressed by the art of her mother, grandmother, and great-grandmother. These strong women and their paintings enchanted her throughout her youth and help inspire her today. 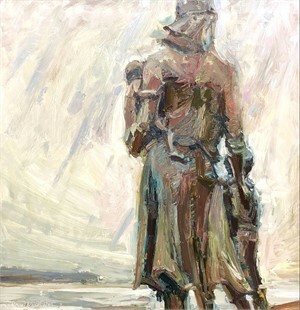 Her great-grandmother, Georgia Leigh Caldwell, was an American Impressionist. In 2010 Alison graduated from the University of Maryland, College Park, with a degree in Art and Art History. She has studied art abroad in Thessaloniki, Greece and in Amsterdam, Netherlands, and has attended over a dozen workshops with talented artists around the world. Her journey into landscape painting began in 2011 when a three week solitary trip to Colorado turned into a five month foray into plein air. She painted every day, camped in national parks, sold studies out of the trunk of her car, and created over 150 paintings. With a desire to travel and learn from her peers Alison has spent the past three years attending plein air competitions and festivals. Between the plein air seasons of 2016 and 2017 she attended 26 competitions along the eastern seaboard and was honored with 26 awards. Her successes have garnered attention from local newspapers, Plein Air Magazine, Art Connoisseur, and various publications. Travelling is a large part of Alison’s artistic inspiration. 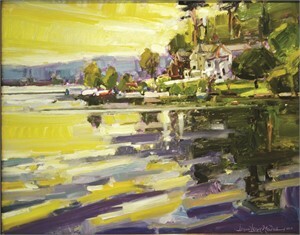 She loves the freshness of new locations and loves to explore how much her palette changes from landscape to landscape. By no means is Alison a nomad. As far as her travels may take her – there is no place like home in Clarksville, Maryland. Alison Leigh Menke Alison is a conceptual plein air impressionist. Her subjects depict the natural beauty of light in the landscape, while emphasizing the rich colors our world has to offer. The vast majority of her work is created in open air, often backpacking to remote locations, or navigating city sidewalks. Alison loves painting directly from real life and experience. Her approach stresses the importance of expressing a true sense of light and place while showcasing the qualities of oil paint and brushwork. Painting thick and thinking abstract design, she loves to use texture and color to move a viewer around her painting. Alison Leigh Menke was born abroad in 1987 and raised in Howard County, Maryland. Growing up she was impressed by the art of her mother, grandmother, and great-grandmother. These strong women and their paintings enchanted her throughout her youth and help inspire her today. Her great-grandmother, Georgia Leigh Caldwell, was an American Impressionist. In 2010 Alison graduated from the University of Maryland, College Park, with a degree in Art and Art History. She has studied art abroad in Thessaloniki, Greece and in Amsterdam, Netherlands, and has attended over a dozen workshops with talented artists around the world. Her journey into landscape painting began in 2011 when a three week solitary trip to Colorado turned into a five month foray into plein air. She painted every day, camped in national parks, sold studies out of the trunk of her car, and created over 150 paintings. With a desire to travel and learn from her peers Alison has spent the past three years attending plein air competitions and festivals. 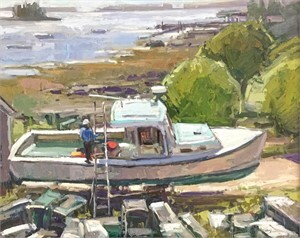 Between the plein air seasons of 2016 and 2017 she attended 26 competitions along the eastern seaboard and was honored with 26 awards. Her successes have garnered attention from local newspapers, Plein Air Magazine, Art Connoisseur, and various publications. Travelling is a large part of Alison’s artistic inspiration. She loves the freshness of new locations and loves to explore how much her palette changes from landscape to landscape. By no means is Alison a nomad. As far as her travels may take her – there is no place like home in Clarksville, Maryland.